POPS GUSTAV: Bronze Beauties #20: SHAZAM! In 1952, after a decade of legal wrangling, National Comics (now DC) settled a lawsuit against Fawcett Publications claiming that the highly popular Captain Marvel was a copyright infringement of their own Superman. As part of the settlement, Fawcett agreed to cease publication of any comic book starring Captain Marvel and his similarly-named “Family.” The characters lay dormant for two decades until, ironically, the same company that killed the Big Red Cheese resurrected him for a new era. Well, sort of. 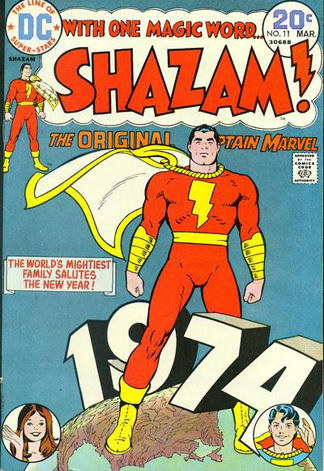 February of 1973 saw the publication of SHAZAM! #1, with a Nick Cardy Superman welcoming Cap to DC on the cover (proving I guess that there were no hard feelings). 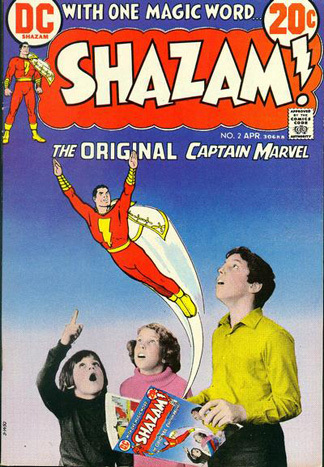 Since Marvel Comics had laid claim to both a hero and a comic book called CAPTAIN MARVEL in the 1960s, DC was forced to name their book after the magic word spoken by Billy Batson to transform into the World’s Mightiest Mortal. In time, due largely to the 1974-77 Saturday morning TV show of the same name, generations of kids would mistakenly call Cap by the name of the old wizard who granted him his powers (a confusion no doubt exacerbated by the TV show’s replacement of Shazam with a “council of elders”). Original artist C.C. Beck was coaxed out of retirement to draw the new stories, but the notoriously crotchety oldster was unhappy with the series from the get-go and left with much grousing after ten issues. Happily, his replacements included masters of the form Kurt Schaffenberger and Bob Oksner (one of my all-time favorite artists). SHAZAM! #2 (April 1973) sports a photo-art montage cover using (I think) an old drawing of Cap by C.C. Beck flying out of an extremely oversized comic book while three kids gawk in awe. The overall design of the cover is a bit awkward, with a lot of empty space, and the small Cap figure almost competing with the masthead figure, but It has a real Golden Age comics feel to it, crappy photo reproduction and all. Bob Oksner drew the New Year’s cover to #11 (March 1974), which was based on a 1945 CAPTAIN MARVEL JR. cover. DC did a lot of these iconic posing covers in the ‘70s, the static nature of which turned off most Kirby-bred Marvelites, but I always loved how they lent themselves to poster-like design motifs. I again probably would’ve removed the masthead Cap and rearranged the blurb and the spots of Captain Marvel Jr. and Mary Marvel (you read that correctly), but Oksner’s super-clean cartooning still is some of the most appealing of all to me. Still, bringing Captain Marvel into the ‘70s was slightly problematic. This pure-hearted man-child character’s tales and look were so light and whimsical that Cap made “blue boy scout” Superman look as dark as that guy in Gotham City. Towards the end of SHAZAM!’s 35-issue run, a more serious, modern take on the character was attempted, but comics fans remained unmoved. In the decades since SHAZAM!’s cancellation, the character’s been bounced around the DC Universe and reinterpreted many times, with varied success (if he seemed anachronistic in the ‘70s, imagine Cap fitting into the nihilistic post-DARK KNIGHT ‘80s!!). To many fans of the character, the Fawcett Captain Marvel is the only true Cap. But for those of us who read the DC comics and thrilled to (okay, maybe that’s a stretch… how about enjoyed) his Filmation exploits, the simple, fun comics of the Bronze era will always hold a soft spot in our geeky hearts. NEXT UP: The Marvel CAPTAIN MARVEL!